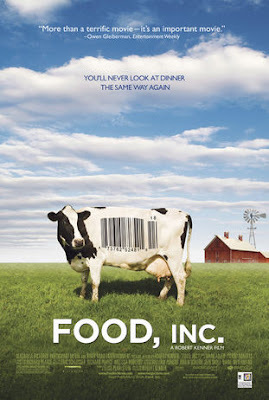 If you need motivation to eat healthier, I highly recommend seeing Food Inc. I saw it on my friend Laura Kreitler's recommendation and it was terrific. A little scary, but terrific. Basically it walks you through the industrialization of Food production. My biggest beef (pardon the pun) was with the subsidies given to the Corn industry. Those subsidies have warped the price of everything related to corn and made high fructose corn syrup a super cheap sweetener. After seeing the movie, I started looking at the food I eat and sure enough, High Fructose Corn Syrup was in a lot of stuff. I've already started to give up soda but it's in weird things, like frozen dinners, or brownie mixes. It's pretty crazy. Anyways, definitely see the movie. Thanks for the rec Laura!